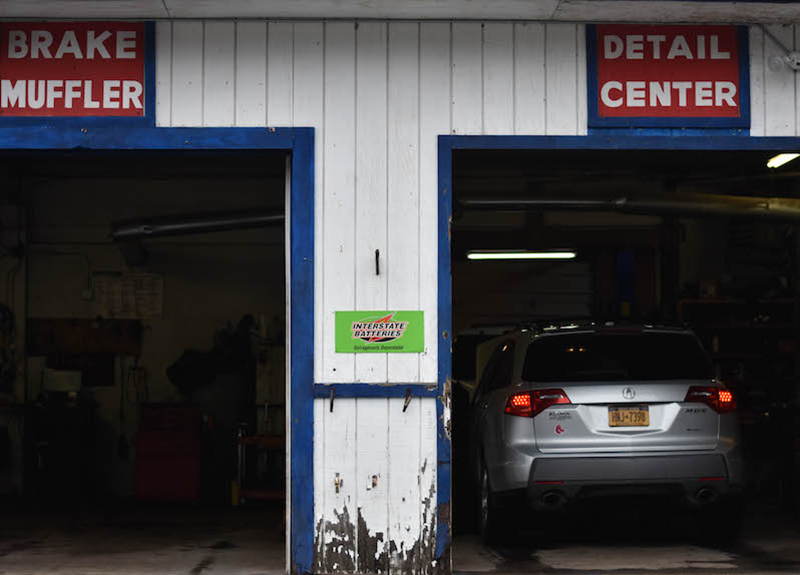 On this episode of Working: Syracuse, Tony Marji talks about what it takes to be a successful used-car-dealership owner. An automotive enthusiast, Marji managed to find a career that allowed him to spend his days surrounded by the objects of his passion — cars. Life as a business owner keeps his schedule full, but after his heart attack a few years ago, Marji decided to focus on the important things in life: his relationships with his family and finding contentment within himself. Always in a rush to do the next thing while finding time for his adult sons, the extroverted 46-year-old comes off as the prototypical used-car salesman despite priding himself on his honesty with his customers. He smokes Marlboro Lights incessantly in and around his small building on the side of U.S. Highway 5 and greets all-comers with a firm handshake from his callused hands. Marji or his partner fix most of the used cars (emphasis on used) before the roadworthy vehicles take a spot in the line along the highway. Befitting a man devoted to mobility, Marji has moved around a lot. He's from California, but he moved to Yonkers, N.Y. and then Wampsville, N.Y. (nearby Syracuse) early in his lifetime. "If you want to talk about a culture shock, I had two, three major culture shocks," he says. "Because you go from sunny San Diego to the hustle and bustle of Yonkers, N.Y., which is the city life, and then you leave the city life and move into a small country town like Wampsville." 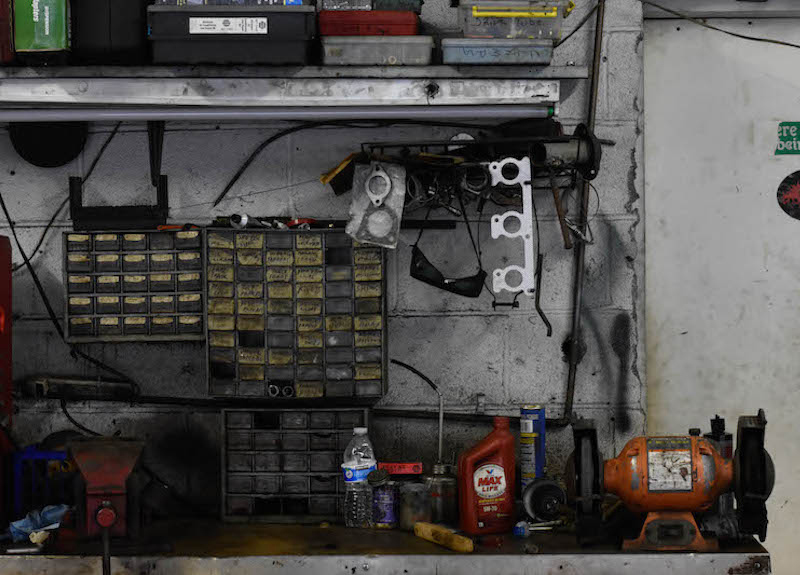 "Do you wanna be the guy that has the jet plane and the helicopter and the house in the Bahamas, or do you wanna be the guy that you know, works 9 to 5, 6 o'clock goes home spends his time with his family and content with what he has," says Tony Marji, owner of Select Express Auto. "I'm content with what I have." Marji's shop sits on U.S. Highway 5, the road that connects Syracuse and Chittenango, which is the birthplace of L. Frank Baum, who wrote The Wizard of Oz. "A good salesman is somebody who needs to be honest. Used-car salesmen have a bad reputation," Marji says. "Every customer that walks in the door has already got a defense, a wall up, saying well you're a used-car salesman; you're gonna lie to me and I don't trust you." "I found it's less stressful and easier to be content with what you have and downsize the business," Marji says. "So it's just me and another guy taking on what we can handle and turning down what we can't." "I saved up enough money to buy a 2017 Corvette convertible," Marji says. "I spend more time watching her than anything." HOST, BRONTE SCHMIT: Hello and welcome to Working: Syracuse, the podcast inspired by journalist Studs Terkel featuring Salt City residents talking about what they do to earn a paycheck and how they find meaning in those jobs. I'm your host Bronte Schmit. For this episode, reporter Zac Palmer took a spin around Select Express Auto to speak with its owner, Tony Marji. Selling cars has been a popular trade since the explosion of the personal automobile in the early 1900s. While selling anything can pose a challenge, a car is likely the second largest purchase a person will make in their lifetime. This makes success in a car sale hard to come by, but it's a success Marji believes he has found. 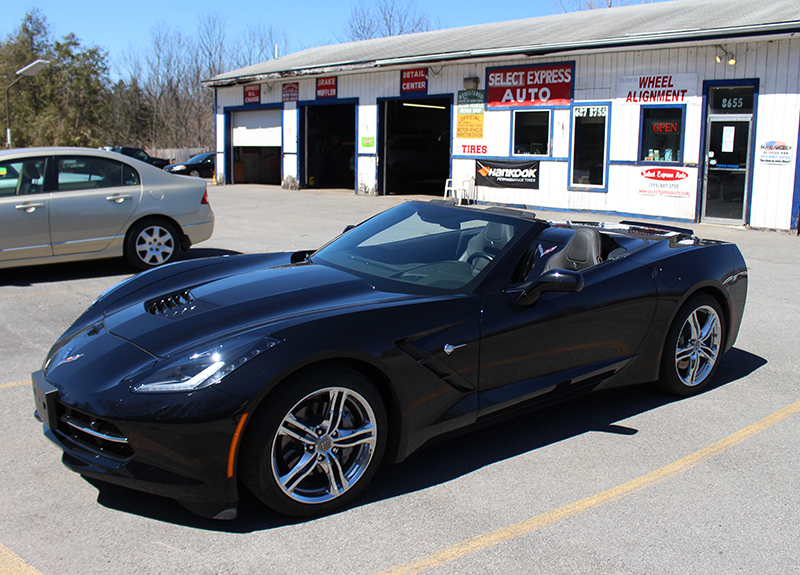 TONY MARJI: I saved up enough money to buy a 2017 Corvette convertible. I spend more time watching her than anything. I've driven her for two months last year. I've barely put 3,000 miles on her. Actually my 19-year-old-son drives it more than I do. He loves it. "Dad you bringin the vette home you bringin the vette home?" And I can't get him to help me, work with me don't do nothin cause he hates cars. He absolutely hates cars. He hates working on cars, he hates getting dirty but that car he don't mind cleaning. He takes it to Delta Sonic, clean it comes back and gas it up. Two hours later, fills up the tank and brings it back with half a tank. ZAC PALMER: Tony walks out onto his small roadside lot with a beanie and hoodie on. He stands just short of six-feet tall and smokes a cigarette in the bitter February cold. 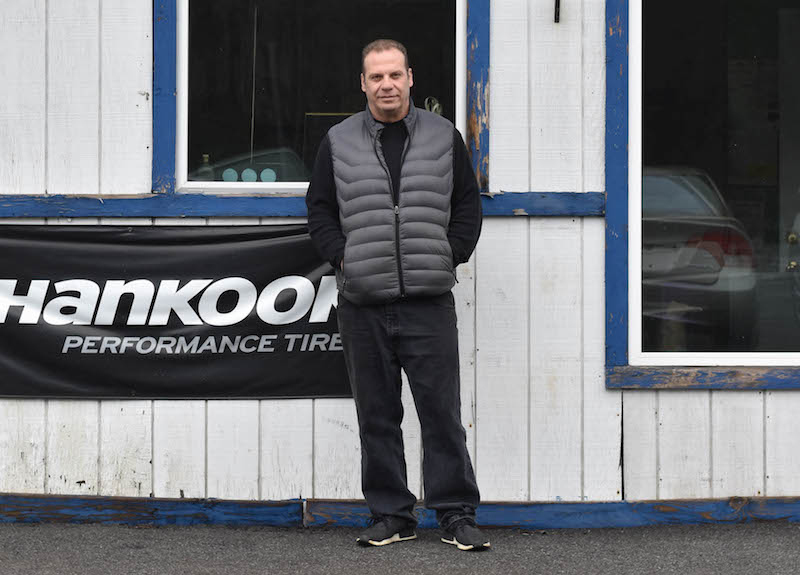 Tony sells and fixes cars out of his small building surrounded by forest and empty land on the side of Highway 5, a location he's been at for over 12 years. A Mustang on one side and a few trucks down on the other end with sedans and crossovers in the middle make up the whole of his inventory. Keys jangle along on his belt as he strides along next to the diagonally parked cars out front. TONY MARJI: My name is Tony Marji. I've been the owner for Select Express Auto for the last 12 years. I'm 46 years old and out of high school I liked cars and my dad was a mechanic and I remember rebuilding our first engine my tenth grade year in high school and I got my drivers license and he wanted to teach me about cars and responsibility and how cars work and that's how I got into this business. ZAC PALMER: Tony ran with his automotive passion and now has a solid grasp of what it takes to be a prosperous used-car salesman. TONY MARJI: Every customer is different. You kinda basically gotta feel the customer out first before. Are they a serious buyer? Are they tire kickers? Are they cash customers? Are they financing? So you kinda basically gotta sit down with the customer and spend some time to get to know what they want and what their needs are. TONY MARJI: A good salesman is somebody who needs to be honest. Used-car salesmen have a bad reputation. Every customer that walks in the door has already got a defense, wall up, saying well you're a used-car salesman; you're gonna lie to me and I don't trust you. That's their mentality of thinking. I've had quite a few people tell me that. So the object of selling a car to a customer is that you don't sell cars. You sell yourself. ZAC PALMER: Tony has sold himself to the point of being able to literally drive around in his success. He comes off as genuine and his business flourishes because he's able to convert customers' apprehension into dollars even beyond the initial sale itself. 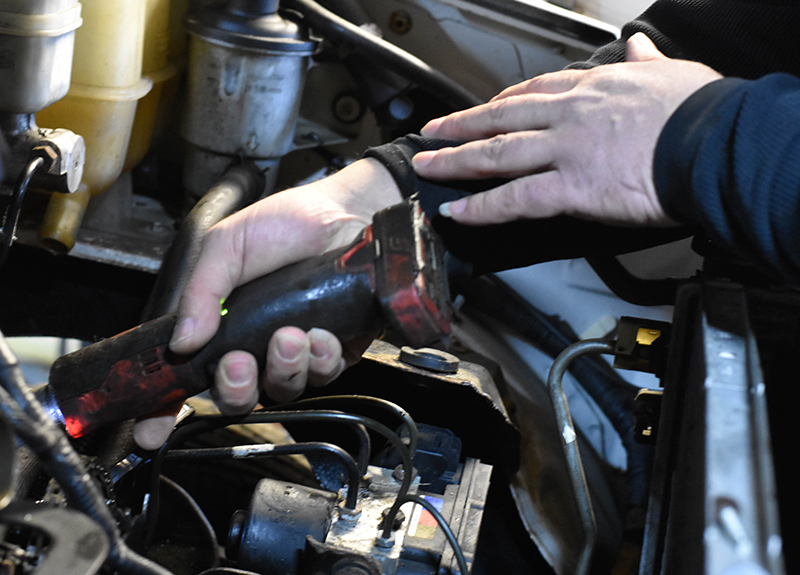 TONY MARJI: When I sell a customer a car I hope to get them to come back, not only just to buy the car but to also come back to service the vehicle here. And when they service the vehicle here, now I know what that car has been done, what I've done to it so I can give them a fair value when they trade it in next time they wanna trade in. Most people own a car for two to three years tops. So yes I do have repeat customers, not only when I treat 'em good and I take care of them. They will bring family members and friends. ZAC PALMER: However, everything isn't easy going for used-car salesmen like Tony. The career, especially as a self-employed individual, is stressful, and Tony discovered that firsthand. TONY MARJI: I used to work from 6 o'clock in the morning until 8 o'clock at night, six days a week. And finally the stress got to me and I had a heart attack. That's when my wife said to me it's time to downsize the business or get out of the business. I put the business up for sale and I sold it to a guy who knew nothing about cars. Six months later he hands me the keys back, says 'Tony I don't know how to run this. Take your business back.' So I did. When I did, I'm doing things differently now. Now I'm downsizing. Me and one mechanic. I only work Monday through Friday from 9 o'clock to 5 o'clock and Saturday's half a day. When I had three employees, three mechanics here, a service manager, and a salesman, I had to always worry about making their paychecks before I make mine. That was the biggest stress. I hated always having to worry about because I didn't want to let guys go. I know they had families I know they had responsibilities and I always had to always keep the business going. Attract new customers, buy more cars, sell more cars; just to give everybody a paycheck. And it came down to it at the end of the day is you know what I gotta stop thinking about everybody else and start thinking about myself. Stop chasing the money. ZAC PALMER: As time passes Tony continues to transition into an almost indifferent view toward what his bottom line looks like. TONY MARJI: As you get older I find myself less hungry to chase the dollar. I'm at a point in my life where you know what, I'm comfortable. I've built up enough customers where I know if today's slow, tomorrow's gonna be busy and if tomorrow's slow, the day after's gonna be busy. Some days I'll sit in here and you see my couch, I'll take a nap and do nothing. And some days I'll come in here and we're running around, like today. Yesterday we sold one, today we sold one and I did two jobs. One was about $2,500 worth of repairs and the other was $750. So with a guy like me that doesn't have much overhead, that's a lot of profit in one day. ZAC PALMER: Tony makes the money he has to now and is still able to spend time with his two teenage sons. He's decided it's better for him to stay close to his family than it is for him to become rich. TONY MARJI: I found its less stressful and easier to be content with what you have and downsize the business and just me and another guy taking on what we can handle and turning down what we can't. Like I said, I stopped chasing the almighty dollar. My house is paid for, I bought the 'Vette for $65,000 cash. All my cars are paid for. I bought this business 10 years ago for $275,000; that's all paid for. So basically in the last ten years I acquired a million dollars worth of assets, enough is enough. And that's what you gotta do figure out in life is: where's your comfort zone? Where do you wanna be? Do you wanna be the guy that has the jet plane and the helicopter and the house in the Bahamas or do you wanna be the guy that you know, works 9 to 5, 6 o'clock goes home spends his time with his family and content with what he has. I'm content with what I have. ZAC PALMER: His paycheck comes when he wants it to. If he feels like he's in a good place then he can take off and do what he wants, a perk of being your own boss. TONY MARJI: Once every three months I'll take a vacation -- week vacation, ten day vacation, and leave. And whoever's working for me at the time either can take a vacation and take some time off or he can stay here and work. Either way I don't get hurt. ZAC PALMER: Tony has found a home and a level of success he's happy with. He's made it. He's got the new Corvette, and nobody can take that contentment away from him, because he knows what got him there. TONY MARJI: It's pretty much just like any other business. You gotta put in your time. You gotta stick with it. And try to keep your overhead as low as possible. When you make money you can't go out and spend it. You gotta save it for rainy days. HOST, BRONTE SCHMIT: Selling and working on cars might bring in the cash, but Marji is authentic when he says he likes to work on cars. He loves to learn, but his true escape is riding snowmobiles through Upstate New York's frigid landscapes. HOST, BRONTE SCHMIT: That's all for this episode of Working: Syracuse. Check out our website www.workingsyracuse.com for more interviews as well as some extra content on Marji. Be sure to follow us on Facebook and Twitter @WorkingSyracuse. Thanks again to Zac for speaking with Marji. This episode was written and produced by Zac Palmer. Extra reporting came from Tiffany Moran and myself. Our theme music was by Logan Piercey. I've been Bronte Schmit. It's time for us to clock out.